Simon & Schuster and New York City's legendary Algonquin Hotel have announced a partnership that will offer guests and New Yorkers an "enhanced visit," beginning with the new Simon & Schuster suite and a series of author events. The Algonquin already has themed suites named after prominent Round Table legends, and guests who book the Simon & Schuster package will stay in a suite on the seventh floor with a living room, private bedroom and S&S memorabilia. A bookcase will house a permanent collection of literary classics and modern bestsellers. As part of the turndown service, guests will find on the first night of their stay an ARC from one of S&S's imprints. "We are constantly looking for non-traditional venues that can expand the range of attendees at author events, as well as partnerships that can bring further visibility to our current publishing and company history," said Liz Perl, senior v-p, marketing, for S&S. "The Algonquin, with its longstanding and illustrious literary tradition, and its appeal to author, reader and traveler alike, is the perfect partner to further that ongoing effort." A speaker series is also part of the partnership, with the publisher and the Algonquin planning to host ongoing author readings at the property. Chuck Klosterman, whose new book is I Wear the Black Hat: Grappling with Villains (Real and Imagined), launches the series July 8. Gary Budge, general manager of the hotel, said the partnership with Simon & Schuster "is not only 'on brand' for us, but brings our guests a wonderful experience to enhance their time spent here." The Arts Annex at Skylight Books, Los Angeles, Calif., is "taking a walk down the block." 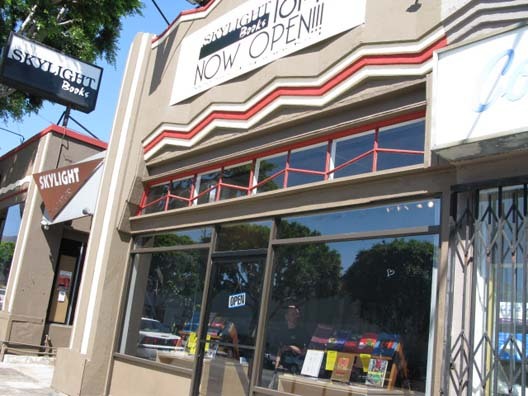 According to the shop's Shelf Talker e-mail newsletter, "We are working with our landlord to help accommodate the arrival of several new businesses that will help keep Vermont Ave. in Los Feliz one of the most interesting places to live and visit. This means that within the next few weeks you'll see our Arts Annex get transferred just one door south." Late yesterday afternoon, Skylight offered reassuring words on its Facebook page to a few concerned, if misinformed, customers: "Just to reiterate, cause there's been a number of confused conversations this morning, it's the ARTS ANNEX that's moving one storefront down. The main store with our skylight and tree and cat are all staying put. And our book poundage sale starts this Friday at 10, but again, only applies to stuff in the ARTS ANNEX. Cool? Cool." Off the Beaten Path Books, Farmington, Mich., is moving from its original location to a new space at 33314 Grand River Ave., where the shop with a "reputation as a go-to for all things steampunk" will re-open July 13. Metromode reported that owner Salathiel Palland, "a steampunker and mother of two," considered foot traffic to be minimal where her store had been and felt that the new space "in the heart of downtown Farmington should change that." "Steampunk is very DIY," Palland said. "What I love about having the products in my store is they're not only from Michigan-based artisans, 80% of it, clothing and everything, is locally handmade. It's awesome. It's stuff you can't get with to your normal mall experience, your normal store.... My goal is to have the largest collection of steampunk clothing, accessories, and products in the state.... It's a one-stop shop for the steampunk experience." The Book Industry Charitable Foundation has expanded its financial assistance program for bookstore employees to include utility shut-off prevention. Under this category, utility assistance may be provided to a bookseller when a shut-off notice has been issued and the household could lose an essential utility (gas, heating oil or electric service only). To be considered for shut-off prevention assistance, a bookseller should visit the financial assistance page on the website for additional details. Binc noted that it "understands that quick action is needed to prevent a utility shut-off. We strive to review bookseller requests confidentially and expediently." 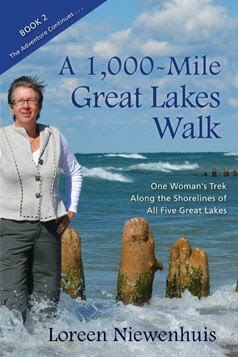 Earlier this spring, Michigan author Loreen Niewenhuis released her most recent book, a travelogue of her journey around the Great Lakes called A 1000-Mile Great Lakes Walk (Crickhollow Books), with an unusual arrangement: for two months before it was available on Amazon, from April until June, the book was available only from 12 Michigan independent bookstores. "I think the independents are vital to keeping literature and reading alive," said Niewenhuis, whose story of walking the entire perimeter of Lake Michigan, A 1000-Mile Walk on the Beach, was published in 2011. "Independents embraced it, and made it a bestseller in the heartland. As a thank you to them, and as a way to support them, I decided to get them books two months before Amazon had access." Niewenhuis is not at all shy about her opinions of the online giant. In May, Niewenhuis wrote a blogpost bluntly titled "Amazon is Evil," and the Amazon listings of her books feature short notes thanking customers for taking a look at the book, but imploring them to buy from an independent store instead. Remarked Niewenhuis, chuckling: "I don't think they've noticed, but it's there." Great Lakes Walk had its launch party at Brilliant Books, the indie in Traverse City, Mich., and during the two months before the book was widely available, Niewenhuis visited as many participating indies as she could. "I love the independents," she said. "Many of these owners are my friends now. I've worked very closely with them, done events at their stores, given lectures in their communities where they can sell books. I really consider myself a partner with indies." Jessilynn Norcross, of McLean & Eakin Booksellers in Petoskey, spoke warmly of Niewenhuis. "She's been a big advocate for the store, and all of the indie stores in the north [of Michigan]. We know her, our customers know her. She's done a lot." 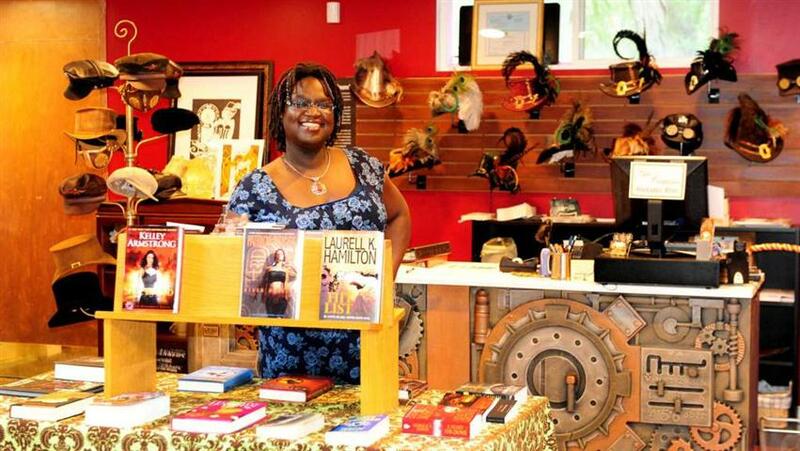 "It's such a boost to independents," said Gloria Tiller, owner of Kazoo Books in Kalamazoo. "In terms of publicity, it was great. And in every newsletter she sends out, she talks about how great all of these indies are for the industry." "She was able to get the word out in the community in a way that most self-published or small press authors haven't really been able to do," said Hilary Lowe, co-owner of the newly opened Literati Bookstore in Ann Arbor. Niewenhuis reached out to the fledgling bookstore owners, and in May gave a presentation there about her walk around the Great Lakes. Lowe drew a sharp contrast between Niewenhuis, who was extremely organized and proactive and published by Crickhollow Books in Milwaukee, and most self-published authors, who "spew Amazon stats at us." Although many authors have inquired about her pre-release arrangement with indies, Niewenhuis has not heard of any other authors replicating it. She hopes to do it again whenever her next book comes out, but on a larger scale, and will give indies a further advantage with marketing and promotion. Vince Flynn, author of the bestselling Mitch Rapp thriller series, died yesterday, the Pioneer Press reported. He was 47. Flynn spoke with WCCO-TV last year about his battle with cancer and dedicated his novel, Kill Shot, "to the doctors aggressively treating prostate cancer." Fantagraphics co-publisher Kim Thompson, who "was active in every aspect of the company, selecting books, working closely with authors, guiding books through the editorial and production process," died yesterday. He was 56. 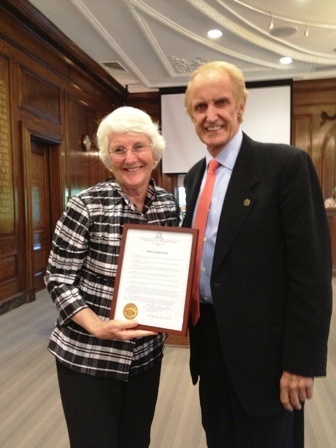 In honor of her more than 30 years as a bookstore owner, her "numerous contributions to the social, cultural, and economic life of the community," and the impending sale of her store, the Book Stall at Chestnut Court, the Village of Winnetka, Ill., has declared next Tuesday, June 25, as "Roberta Rubin Day." Here, village board president Gene Graeble presents Rubin with the proclamation. 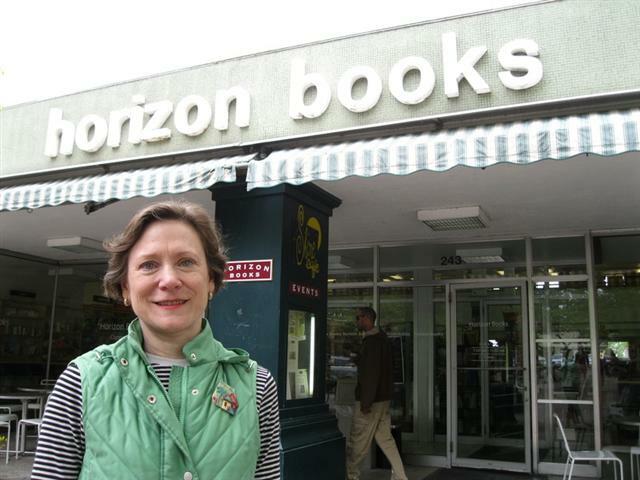 Congratulations to Amy Reynolds, co-owner of Horizon Books, Traverse City, Mich., who has won the Lyle DeYoung Downtown Achievement Award from the Downtown Traverse City Association. "It is very fulfilling," Reynolds told the Traverse City Record-Eagle. "I knew Lyle DeYoung--a great and honest business person. I remember his smile his generosity and graciousness. It puts me in pretty outstanding company." In 1993, Reynolds and her husband, Vic Herman, moved their bookstore to its current location, in what was then a vacant J.C. Penney store in downtown Traverse City, where many other storefronts were vacant. Horizon became an anchor store and helped revitalize the area. Rob Bacigalupi, deputy director of the Traverse City Downtown Development Authority, said of Reynolds and Herman: "There was a big shadow cast over the future of downtown, and they took a big leap of faith." The show--or in this case author event--must go on. 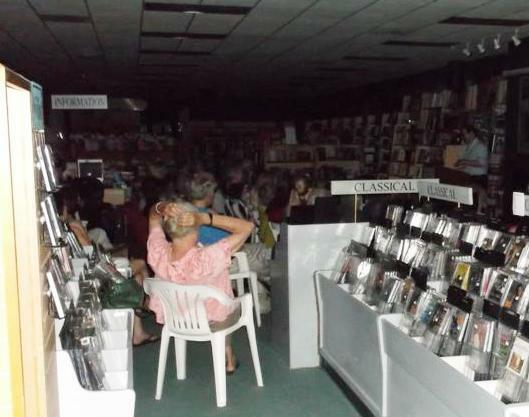 Before last week's reading at Quail Ridge Books & Music, Raleigh, N.C., fans of Will Schwalbe, author of The End of Your Life Book Club (Vintage), had reason to pause when a violent storm cut electricity to the area, including the bookstore. "As a testament to how much people wanted to hear Will, 47 people came to the door and asked if we were still going to have an event," recalled events coordinator René Martin. "Will had arrived early and was standing near the front door. Thank goodness for daylight savings time! He was game. So we had the event in the dark with flashlights and some LED candles hurriedly purchased next door. You will not be surprised to hear that Will was wonderful and it was a very appreciative audience." Phone numbers and e-mail addresses will remain the same. The Green Boat: Reviving Ourselves in Our Capsized Culture by Mary Pipher (Riverhead), a guide to "transforming our fears about our global environmental crises into awareness, resilience, and, ultimately, action." Today on NPR's Fresh Air: Jonathan Alter, author of The Center Holds: Obama and His Enemies (Simon & Schuster, $30, 9781451646078). Today on NPR's Talk of the Nation: Sarah Dunant, author of Blood & Beauty: The Borgias, a Novel (Random House, $27, 9781400069293). Tomorrow morning on the Today Show: Brian Boitano, author of What Would Brian Boitano Make? : Fresh and Fun Recipes for Sharing with Family and Friends (Lyons, $27.50, 9780762782925). Tomorrow night on HBO's Real Time with Bill Maher: Michael Pollan, author of Cooked: A Natural History of Transformation (Penguin Press, $27.95, 9781594204210). Noting that "dinner parties can sometimes yield business deals," the Boston Globe chronicled a chance meeting that led to a film option. Author Elinor Lipman "found herself eating with actor John Lithgow not long ago, and it was suggested by a few others at the table the Oscar nominee would a make a great Henry Archer, the main character in Lipman's The Family Man." 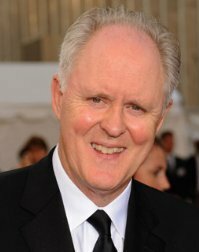 Lithgow has since optioned the book and plans to adapt and star in the movie, the Globe wrote. "Hardly anyone follows up on idle table banter, let alone reads and options, but he did," said Lipman. 12 p.m. Book TV interviews author Scott Turow, president of the Authors Guild. 4:45 p.m. Larry Colton, author of Southern League: A True Story of Baseball, Civil Rights, and the Deep South's Most Compelling Pennant Race (Grand Central, $28, 9781455511884). 7:45 p.m. Ralph Nader, author of Told You So: The Big Book of Weekly Columns (Seven Stories Press, $29.95, 9781609804749), at Politics & Prose Bookstore, Washington, D.C.
11:30 p.m. Jeremy Scahill, author of Dirty Wars: The World Is a Battlefield (Nation Books, $29.99, 9781568586717). 7 p.m. Brian Michael Jenkins, author of When Armies Divide: The Security of Nuclear Arsenals During Revolts, Coups, and Civil Wars (Brian Michael Jenkins, $8.75, 9780989161145). 10:45 p.m. Ying Ma, author of Chinese Girl in the Ghetto (CreateSpace, $9.99, 9781460970454). Sally Gardner won the CILIP Carnegie Medal for children's literature for her novel Maggott Moon and illustrator Levi Pinfold won the CILIP Kate Greenway Medal for excellence in illustration for his book Black Dog. Karen Robinson, chair of the judging panel for 2013 and Youth Libraries Group chair, said the "heroes in both Gardner and Pinfold's exquisitely realized and highly original books are the antithesis to the heroes we come to expect from Hollywood; both are small and without obvious talent. But in the face of terror their pluck, courage and hope shines brightly through. I'm confident that both books are true modern classics and will be read and enjoyed by generations to come." Alice Munro won her third Trillium Book Award, which honors the best writing by Ontario authors, for her collection Dear Life: Stories, Quillblog reported. The other Trillium winners were Matthew Tierney's Probably Inevitable for English-language poetry, Paul Savoie's Bleu bémol for French-language book and Claude Forand's Un moine trop bavard for French-language children's literature. Munro and Savoie both received $20,000, while Tierney and Forand took home $10,000 each. Beautiful Day: A Novel by Elin Hilderbrand (Reagan Arthur, $28, 9780316099783) explores a Nantucket wedding planned by the bride's deceased mother. Sisterland: A Novel by Curtis Sittenfeld (Random House, $27, 9781400068319) follows identical twin sisters with psychic powers. Beautifully Unique Sparkleponies: On Myths, Morons, Free Speech, Football, and Assorted Absurdities by Chris Kluwe (Little, Brown, $27, 9780316236775) contains the eccentric thoughts of the Oakland Raiders player. Italy in 1943 and 1955 is the setting for The Light in the Ruins, a story of lives turned upside down, lives lost, a doomed romance and the ravages of war. Chris Bohjalian (The Sandcastle Girls; Midwives) has spared no grisly detail or gratuitous brutality in chronicling what happened in Tuscany near the end of World War II. The Rosati family, living in Villa Chimera in the Tuscan hill country near Florence, are in a halcyon redoubt that suddenly becomes a battleground when the Germans drop the mask of being allies and become enemies and occupiers, forcing the Rosatis to live in one small room, taking over the villa and its grounds, and looting the Etruscan tombs on the property. Before this, the noble Rosatis had been able to hold the harsh reality of war at bay. Cristina, 18 years old, rode her beloved horse, swam in the pool with her sister-in-law, her niece and nephew and her parents, the Marchese and Marchesa. Her two brothers, Vittore and Marco, were in the army, but still nearby. The family's hope was that the war was nearly over and soon they would be together again. Then Cristina falls in love with a German officer, to the consternation of parties on both sides. We learn about this history in chapters that alternate with a series of murders, and the subsequent investigation, taking place more than a decade later. An eerie monologue in the voice of the killer serves as prologue to the 1950s storyline, but Bohjalian doesn't reveal who he is--or why the Rosatis are being killed. First, Cristina's sister-in-law Francesca is killed, her heart removed and placed in an ashtray; then the Marchesa is murdered, her heart also removed. What does this signify--and who is next? Serafina Bettini, the only female homicide detective in Italy, investigates the crimes. There were always rumblings in the village that Marchese Rosati was too cozy with the Germans, so the list of suspects is long. Her quest brings her back to the villa, where she once fought as a partisan and was grievously wounded, leaving her with scars both visible and invisible. Shelf Talker: Bohjalian writes of the horror of war visited upon a peaceful Tuscan villa, bringing about tragedy and repercussions many years later.